All too often as busy mums our shoes are the last things we throw on as we’re running out the door! It’s so easy to let fashion slip to the side on a busy day but with a moment’s thought and the right pair of shoes you can elevate your look from basic and plain to chic and stylish. 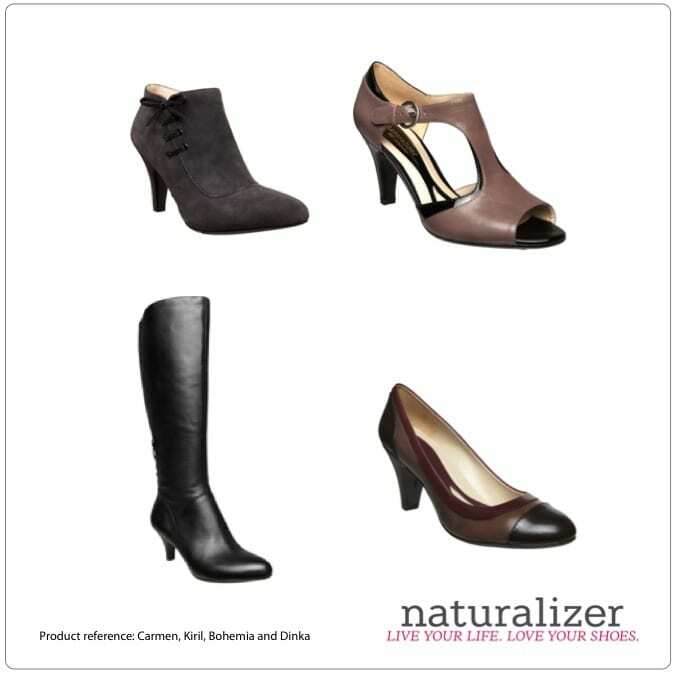 Naturalizer has been providing comfort and style for women across the world for 85 years, so we asked their Chief Designer to tell us what the key trends are for Autumn/Winter 2012. “Boots will continue to be hugely popular this season, great for wearing over jeans and leggings for an effortlessly stylish look. For warmth as well as style, look out for suede, patent and leather accents on both shoes and boots. Influences from early 20th century eras including the 30s, 40s, 50s and 60s will be in Vogue, along with lady-like looks, and if you only buy one colour this season, make it the elegant neutral – camel”. This Autumn/Winter, expect to see a return to a bygone era, with styles influenced by the 1930s and 1940s – classic, sophisticated looks with a modern touch. We need to be inspired by both military and high-society, with feminine loafers, lace-up boots, top-stitched wedges and mannish brogues. Wear these with the autumnal colour palette of camel, dark and warm browns and deep red. Team with capes, fur jackets or shearling coats to complete the look or dial up the military styling with menswear-influenced trousers and structured jackets in navy, green or grey. As the weather cools down, we’ll also be inspired by two other classic eras in fashion – the 1950s and 1960s. This look is prim, proper and elegant, channelling Jackie O and Grace Kelly and modern-day princesses Duchess Catherine of Cambridge and Princess Mary of Denmark. From feminine accessories like glasses, gloves and narrow belts, to bow detail and dresses with pearls, the look is defined by antique metallics, patents and suedes throughout shoes and accessories. Wear your most Madmen-like dress and glide out the door! The final trend for Autumn/Winter 2012 is city chic with an urban edge, so look for minimalist, sleek lines with architectural detail. We’re going to be moving away from the brights of Spring/Summer, but colour-blocking will remain a dominant trend with winter neutrals coming into play. Camel will again be a key colour, as well as black, grey, brown and dark red. Clothing is also minimal and sleek, to take you from appointments to dinner style. Above-the-knee dresses in wearable fabrics like jersey, straight skirts and narrow-legged pants can be worn with peep-toes and three-quarter-length boots. Whilst the styles are minimalist they stand out with textures, such as patent and suede which will feature heavily this season. Even if you’re feeling somewhat daunted by the thought of all these trends, don’t feel you need to be a slave to every one of them. Take the essence of the trend, team that with a pair of stylish (but oh so well made and comfy) Naturalizers and you’ll be the yummiest mummy at drop off! What’s even better? You’ll still be wearing them at pick up and your feet will be thanking you for it! The content in this post was supplied by Naturalizer as part of the Naturalizer MoM Review campaign. 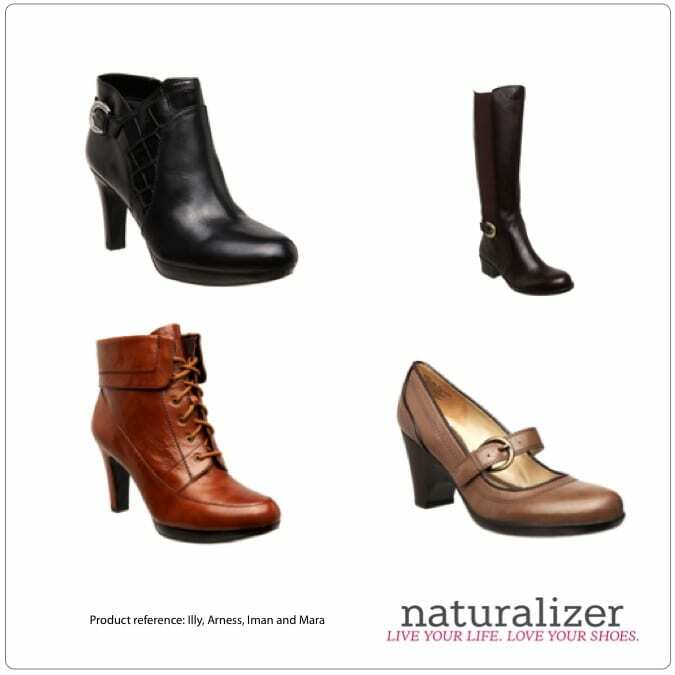 Stay tuned to hear what our MoM Review team have to say about Naturalizer shoes or take a look at the Review Page here or visit the Naturalizer site to view the entire Autumn/Winter 2012 Collection. Love the red shoes with the wings, they look amazing. I love the classic looks that don’t go out of style quickly. Love boots! The best shoes for winter. now all i need is someone to buy me some of these pretties! oh well ill just keep dreamin! Bad footwear can let an outfit down badly. 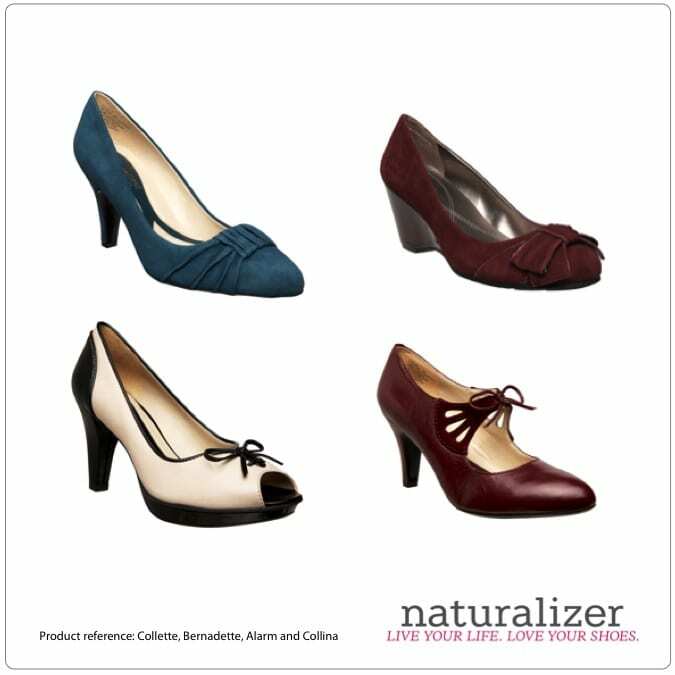 Naturilizer shoes are so comfortable and stylish. A definite winner! I find it do hard to find stylish winter shoes. I admit to being relaxed about my footwear. I tend towards comfortable footwear, rather than fashionable. If my comfy shoes also look fashionable, then that’s a bonus, but I’d never buy & wear shoes that weren’t comfy, just because they were in fashion. Thanks for sharing this, I really like the look of the boots. Love the red ones & the boots of course.